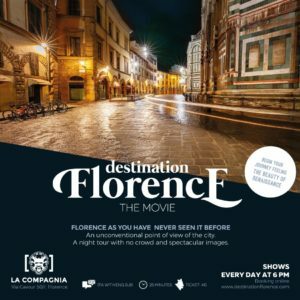 The short film Destination Florence is now playing at the Cinema La Compagnia (Via Cavour 50/r) every day at 6 p.m. The 25-minute movie, set at nightfall in Florence, shows a different and intimate side of Florence with stunning imagery. Churches, towers, piazzas, streets, paintings and sculptures are featured – including lesser-known landmarks – inspiring viewers to look at Florence with a fresh perspective and explore the full extent of the city. The uncrowded nighttime setting lets the city’s art and beauty shine and exposes new elements of Florence. Cinema La Compagnia, which hosts documentaries and film festivals, contains a bistro and is located just steps from the Duomo. The short film is a Rai Com production, and it is in Italian with English subtitles. Tickets are 4€ each.